Robotics can make farming kinder on cows and take data collection to a new level. Robots can take up the early morning and afternoon milking duties and free up the farmer to complete other important jobs on the farm, writes Jamie Gray. Proponents of the latest thing in dairy - robotics - emphasise the animal welfare benefits the machines can bring. The labour cost savings are not big, but in some circumstances, improved production can come from going high tech. Another attraction is that it can free the farmer up to do other things that can be beneficial, such as pasture management. Then there are the lifestyle advantages. It means not having to get up at an ungodly hour to milk the cows and in the afternoon, attendance at school sports days can become a reality. But Grant Vickers, DeLaval NZ's robotics expert, says the biggest selling point is that cows like it. Or, as one of his clients put it: "It allows the cows to take over the farm." Robots have been in cowsheds since the 1990s. Vickers estimates they have been installed in two or three dozen sheds around the country. The proportion of robotic use is quite high in the established dairy producing countries of Europe, and Vickers expects perhaps 10 to 20 per cent of farms will be using them in New Zealand over the next 10 to 15 years. Vickers, a former farmer, says there is a huge lifestyle advantage for the farmers but the biggest selling point is the improved animal welfare. "This type of farming is much kinder on cows. We take the stress right off them and we are seeing indications of improved longevity of the cattle," he says. "The robots will do what they say they do on the packet. They will perform well and will milk cows to a higher standard than humans do." Under a voluntary system, the cows are not left standing on concrete for hours at a time waiting to be milked. "They are not bullied and pushed around by other animals, and they are not driven up and down by farm hands on motorcycles. "They travel at their own pace and choose when they want to be milked," Vickers says. Production can improve with robotics, but he says that's not the main selling point. "The people we talk to are generally the top-end farmers - who are doing a good job already with the way they feed their cows and milk them, so we can't really promise them any production increases," he says. "However, where we can get production increases is among those farmers who might not be at the top end. "What tends to happen is that farmers who adopt robotics learn how to manage grass and feeding better. Those guys are going to get an increase in production," says Vickers. There are systems in place already that will weigh the animal, check out its milk quality, assess its feed requirement and its overall health, but Vickers says robotics can take that kind of data collection to a new level. The latest technology from DeLaval includes a somatic cell counter. In dairying, the somatic cell count is an indicator of the quality of milk, and whether it contains harmful bacteria. It also provides information on the levels of mastitis in a herd. Vickers says robots, complete with cameras that monitor a cow's overall condition, can also provide the farmer with a deeper level of knowledge. Farms that use robots tend to be set up in such a way that the cows can be milked up to three times a day - or once every eight hours - with each milking timed as they move past the cow shed to a new paddock. David Johnstone says by going robotic there were savings in terms of improved animal health. Vickers tends to describe it as "voluntary milking" as opposed to milking by robots, because it is the cows themselves who decide when they will be milked. It's not necessary to have a human in the shed while the process is going on. He says bullying in a cow herd is a very real problem, and robots can help alleviate that. "Bullying is a huge cost to the industry because a stressed animal can be difficult to calve again. "If we take away the bullying and let the heifer operate around the farm at her own pace, the chances of getting her in calf early in the first mating are a lot better," Vickers says. The more leisurely approach means cows are not pushed through races en masse, and that can reduce the level of lameness. Vickers says robots can be used on any scale - he knows of one farmer who milks just 60 cows with one robot. But he says the optimum size tends to be the 200 to 400-cow farm typical in Taranaki and the Waikato because they are the types of properties that tend to be the easiest to convert to a voluntary grazing system. Vickers says labour cost savings arising from robots are a bit of a myth. "But there is a huge lifestyle advantage, in that you are not committed to going to the shed at 4.30am for three hours, and again at 3pm for another three hours. "You have work to do at the shed, but you can do it at times that suit yourself," he says. "The input that is needed in a voluntary grazing farm is in management, rather than the hands-on labour that you get in with a conventional dairy shed." 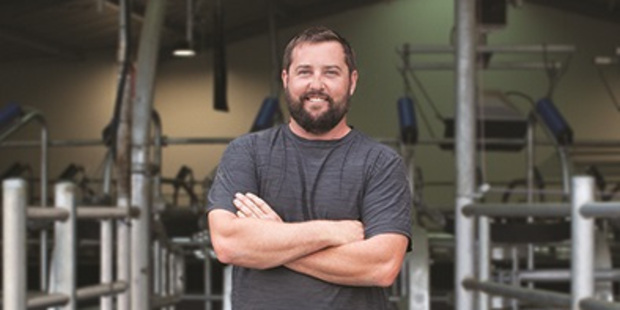 Vickers says robotics can help farming families with their succession plans, as sons and daughters are more likely to return to the farm when it represents less of a manual undertaking. In addition, the younger farmers are more likely to assimilate the extra data that a high-tech farm generates. Vickers says the days of big expansion in dairy, with high numbers of sheep farms converting to dairy, are numbered. These days dairy farming is more likely to be focused on the improvements that can be made within the farm gate. "We want do better with what we have got," he says. Southland farmer David Johnstone, who farms near Winton, insists the few hours of extra sleep is not the main reason he went robotic. Though the robots help to promote a better work-life balance, the main benefit is that it frees up time to further improve the farm's performance. Johnstone's four robots take care of the whole milking process, from teat cleaning to attaching cups to the animal. While the cow is being milked, its health is being evaluated and the appropriate amount of supplementary feed is dispensed before she leaves the shed. It's all voluntary. Cows mosey on in when they feel like it, and leave when they want to. Johnstone says the herd seems to be happier than a typical herd on a conventional farm. He says the process generates vast amounts of data. The technology details how much milk they have, the time they came into the shed to milk, the amount of feed they were given, their weight, data around milk composition, their preferred robot, and whether they are in heat. The property has 320 cows, available for milking, 24 hours a day, seven days a week. Johnstone, an early adopter of the technology, bought the farm three years ago and installed the latest gear soon after. 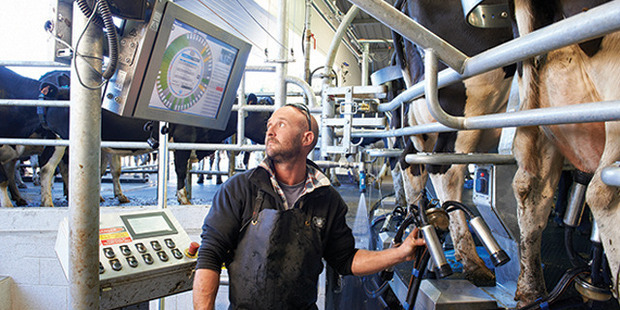 His 100ha farm was converted from sheep to dairy nine years ago, and was one of the first in NZ to use robotics. He says there is no "huge" economic benefit from going robotic but but there are savings in terms of improved animal health. "It's not really a big labour-saver. You end up doing other things that can fine-tune your performance." The farm has its own support blocks and is quite self-contained. Silage is made on the property, so there is a higher workload in that respect. Johnstone says there are slightly higher maintenance costs, plus the higher capital costs. But the technology is becoming more popular with older farmers who want to cut back on the job's physical demands. "We all want better quality time and a better work-life balance," he says. "It's not for everyone, but for us it fits in with what we want to do."